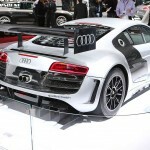 Audi Motorsport has unveiled its new R8 LMS ultra race car in Geneva this week. 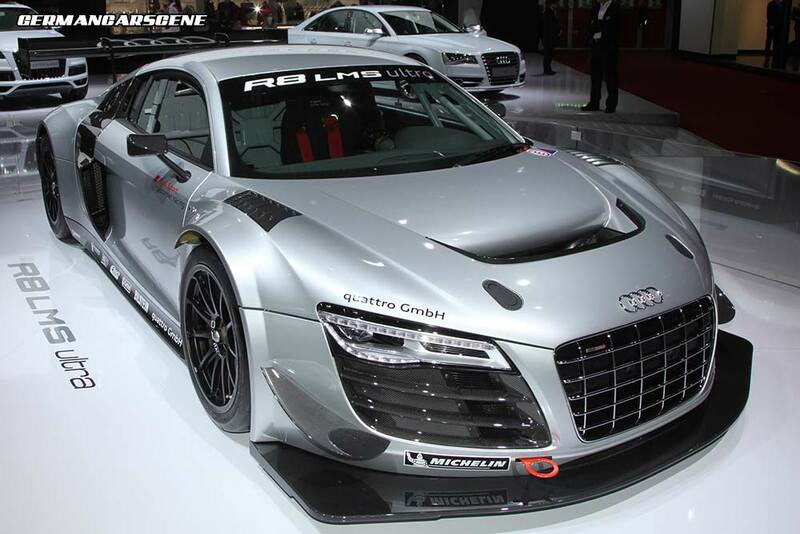 Apart from the utilization of the new R8 road car’s head and tail-lights, the 2013 vehicle features redesigned front-end aerodynamics, underfloor modifications allowing a more precise airflow into the two wheel arches and out through the louvres on top of the fenders. The smaller wing mirrors also help to improve the drag coefficient, resulting a higher top speed than its predecessor. 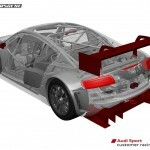 The most notable differences to this season’s car can be seen at the rear, with a ‘hanging mounted’ wing reminiscent of the DTM racers, a much larger rear diffuser divided into a centre section and two channels, and relocated exhausts which now exit through where the number plate would usually sit. Weight-saving measures include the use of forged aluminum wheels, which can now be fastened using a steel nut and undercut their magnesium counterparts by one kilogram per wheel, and a Makrolon windshield weighing three kilograms less than the glass equivalent. The triple-plate sinter metal race clutch saves even more weight. 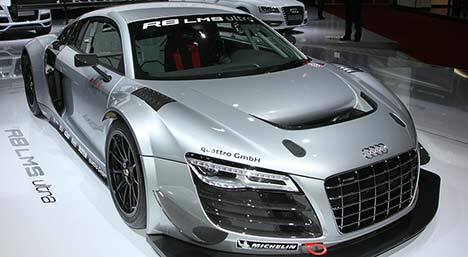 Under the engine cover, the 5.2-litre V10 unit remains almost unchanged from the production R8, with some customers reporting trouble-free racing for over 20,000 kilometres. An output of up to 419 kW (570 hp) and over 500 Nm of torque is available, depending on the competition and its restrictor regulations, which it transferred to the rear wheels via a sequential, pneumatically activated 6-speed gearbox. 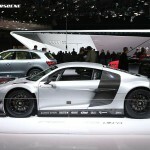 The car is priced at €339,000 (plus VAT) with customers already starting to receive theirs.